One of our favorite themes for wedding table decoration in 2014 is country chic – something that never goes out of style and fits so well with a wedding in Tuscany. 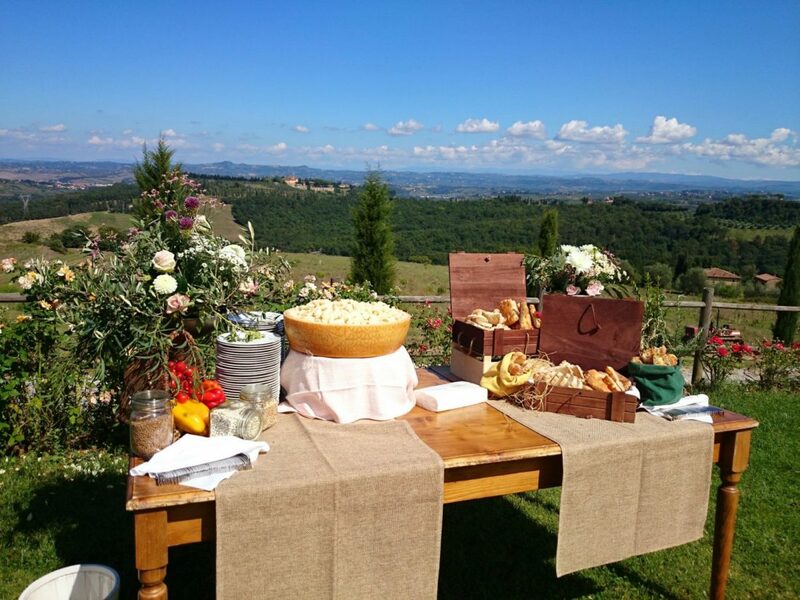 As you can see in the photo below we have incorporated native Tuscan lavender to decorate the napkins, with an abundance of flowers and flower petals to create the wonderful atmosphere of the countryside. We used mini chalkboards with the names of the bridal couple and the date of their wedding on each table. We can also incorporate vintage corks into the decoration along with special numbers which are significant to the bride and groom – such as the address of their new home, the date they met or the date when the groom proposed. In the past we have used these distinctive numbers on embellished cards which we placed on top of flower-filled antique birdcages for a distinctive table decoration. Another unique idea for a country chic wedding table decoration in 2014 is to use vintage keys attached to decorative cards on which are written the names of the guests and their table number. These can be given to the bridal couple as a memento of their special day or kept by the guests. Couples are being more eco-friendly nowadays, and at BeA Alfresco Wedding we can arrange a ‘green’ wedding reception for you in Italy. Many of our venues are eco-friendly, we use natural themes, repurpose many antique or reusable items for the wedding table decorations, and are very conscious of the effect of the wedding party on the environment. The ‘green’ bride would probably opt for organic table linens, such as cotton or linen, for her wedding table decorations; and may even wear a dress made from an organic fabric. More stylish couples may want to go with the latest color trends for 2014 – the sunny hues of citrus fruits along with rich purples and browns are going to be the fashion for next year. These colors can be incorporated into any wedding theme, whether it be country chic, retro, vintage or modern. And of course, in Tuscany we have so many venues for you to choose from! You can have a stylish, modern wedding and reception in one of the amazing ancient buildings in our beautiful cities. Here you can use bold floral centerpieces to create a dramatic theme for your wedding table decorations, and at BeA Alfresco Wedding we can arrange this for you – whatever theme you choose you can rest assured that we only use the best suppliers, have many suggestions to help you make your decision, and will be there with you every step of the way. We will ensure that your wedding table decorations in 2014 are the best, most memorable and impressive!